The New Zealand Youth Choir (NZYC) won the hearts of audiences and the judges when achieving a clean sweep, winning all four categories they competed in, at the 24th annual International Festival of Academic Choirs in Pardubice, Czech Republic over the last four days. Then, this morning NZ time, they crowned their outstanding performance by winning the overall grand prize – the Grand Prix. 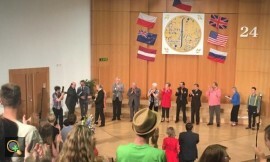 The NZYC competed against 15 European choirs from Russia, Poland, Latvia, and Czech Republic. The choir will now continue its international tour to Le Quesnoy, a small town in northern France, which was liberated by the NZ Division just four days before the end of WW1, to participate in their memorial services. From there NZYC will travel to Paris to participate in High Mass at Notre-Dame Cathedral singing an all-Kiwi programme and then to the UK to perform in Oxford, Windsor Castle and the prestigious St John’s Smith Square concert hall in Westminster.